Early last summer I met with David Cohen, owner of Boyer’s Diamonds in Williamsburg, and his amazing girlfriend Kerri. 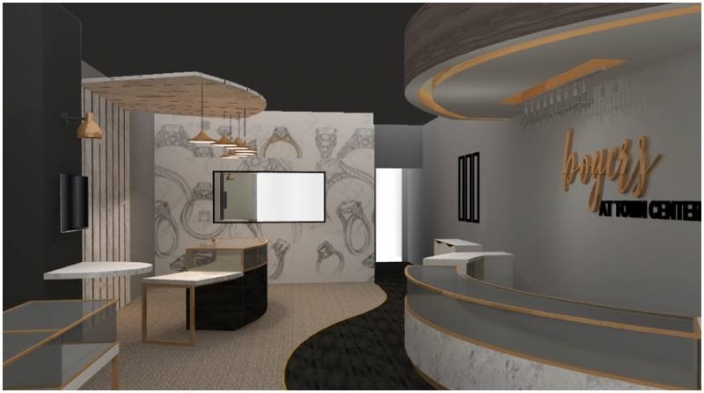 Together, they had a vision of a new store in Town Center that would wow their customers. I started throwing out ideas almost immediately after seeing the space. After a few iterations, we ended up with a layout that was visually pleasing just looking at the plans…so we knew the build-out would be awesome. 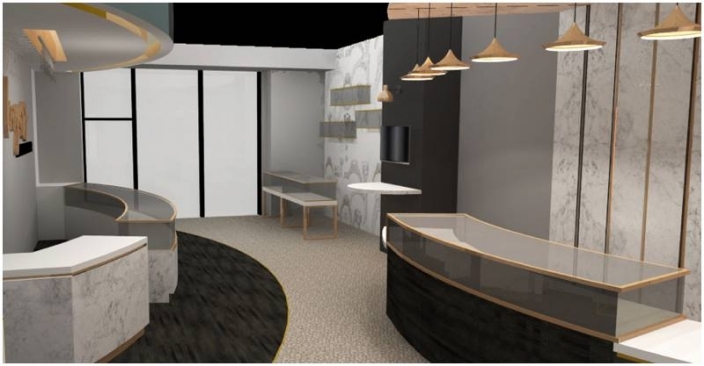 We started right away with the renderings since we knew the cases would have to be special made specifically for the store. The design features a wood walkway that leads to the back of the store and an accent wall in the back, both tactics meant to bring traffic all the way into the store. Soffits and floating ceiling structures with pops of metallic to make the high ceilings more comfortably scaled. Here is the actual build-out done by the talented team at Gateway Construction. We ended up doing navy on the back wall, and a navy ceiling. I love tying walls to the ceiling because it makes the space feel more all-encompassing…the marble/gold fixture behind the back jewelry counter is another example of the wall/ceiling installation. Another view of rendering to reality looking from the back of the space toward the front. 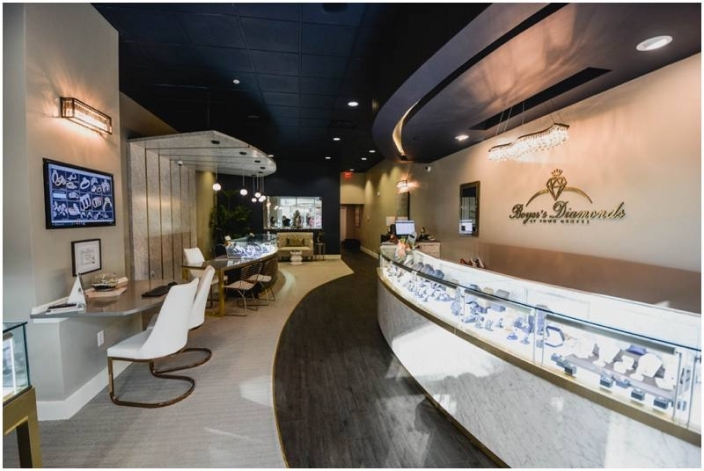 Here are some more pictures of the beautiful space and the fabulous jewelry they offer!! You can even design your own using their software! Even the bathroom is fabulous! You can’t go wrong with a Christmas gift from Boyer’s! !